Western fairy tales have ogres, trolls, and bogeymen. Middle Eastern tales have Jinni. In japan, they have Oni, which can come in many different colors. Usually they're super bright ones too so if you're trying to make sure they don't sneak up on you, you should be pretty safe. You might not have to worry about the Oni either though. Many stories suggest that these kinds of demons actually respresent both sides of the spectrum. Some can be evil and feast on humans (they've got the teeth for it), while others are friendly and want to help you with whatever you may need. It's just unfortunate that the good ones and the bad ones look exactly the same. It's a bit of a dangerous guessing game if you ask us. So what type of Oni will you be on this next hallowed eve? A trick one, ready to mess with all the others out looking for candy, or a treat that only looks like something scary? 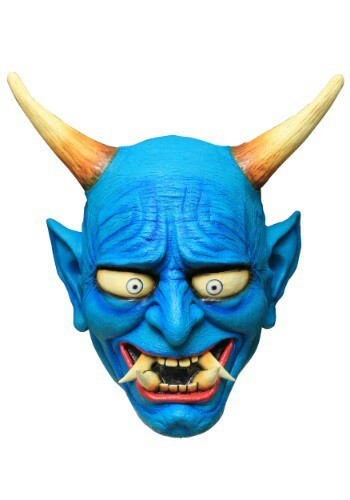 This bright blue demon mask is great for either. The giant teeth and horns are perfect for scaring everyone away while the eyes and bright colors are goofy enough to make anybody who sticks around laugh. That's what we call diversity!